If you’re a pashmina scarf collector like myself, keeping them organized can be a bit challenging once you start to own more than a dozen. After a while , folding the scarves does not seem to cut it anymore because you’ll always need the one in the middle and when you pull it out everything gets all messed up. 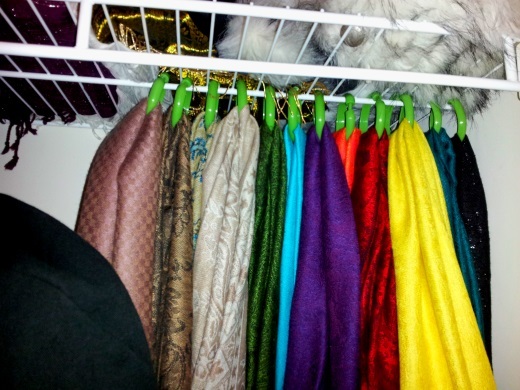 Here is a simple and easy way to make a scarf hanger to keep them all organized for one dollar. The answer: go to the dollar store and buy a package of the plastic shower curtain rings. Buy as many as you need for the scarf collection that you have! Then attach them to a hanger or if you have the wire closet organizer (like I do) attach them to the back. Attaching them to the back of the organizer let’s you still see the scarves that you have while keeping them out of the way of your regular closet space. That’s it. Instant scarf hanger for just one dollar! ← "Rise of the Guardians" Movie Review - More Elves Please!